If the topical rosacea treatments are ineffective or causing intolerable side effects, your dermatologist in Manhattan may begin treating you with oral antibiotics. Oral antibiotics can be effective for moderate to severe cases of rosacea, especially if the affected area is widespread.A�Make your appointment today to experience highly personalized and comprehensive New York dermatology care. Come see the Manhattan Dermatology office and meet a leading dermatologist in NYC Dr. Susan Bard. Get the care you need in the safe, reassuring hands of the best rated dermatologist in NYC. A chronic yet routine skin condition in people over the age of 30, rosacea generally manifests itself as the extreme visibility of red blood vessels in your cheeks, nose, and forehead. It often appears in flare-ups lasting for several weeks or even months, only to then temporarily disappear into remission. Unless you have it treated, it will continue to recur. The disease can sometimes lead to a swelling of your nose known as rhinophyma. For many patients, watery and bloodshot eyes due to ocular rosace are another unfortunate result and can lead to both burning and soreness. In certain cases, New York City dermatologists have noticed that if you leave it untreated, the disease can evolve into pus-filled bumps. These small facial pimples can be confused with acne or an allergic reaction. You should always consult a professional dermatologist if you notice these and other symptoms of rosacea. Facial redness or flushing: Regardless of your skin tone, the erythematotelangiectatic rosacea usually results in a persistent redness or transient flushing in the middle of your face. It’s the result of inflammation in the numerous blood vessels at your skin’s surface. Pimple-like bumps: With papulopustular rosacea, small pus-filled bumps may appear on your face. They resemble acne, but your skin may feel hot and flushed. Eye irritations: About 50 percent of rosacea patients also experience ocular rosacea resulting in eye irritation such as dry, bloodshot eyes, swelling and inflammation of your eyelids (blepharitis) and a sensation of a foreign substance on your eyeball. It can lead to ulcerations on the cornea (keratitis), which can lead to light sensitivity (photophobia), eye pain, and poor vision. The discomfort in your eyes may even precede the telltale symptoms on your skin. If left untreated it can lead to permanent vision loss. Rhinophyma: This condition simply refers to the enlargement of your nose that can occur with phymatous rosacea. Though rare, the oil or sebaceous glands in your nose, chin or cheeks may swell up in severe cases. This particular symptom is generally more common in males than females. Microscopic mites: Also known as demodex folliculorum, these mites usually exist on the human face without causing any harm. However, individuals with rosacea have much higher numbers of microscopic mites, although it’s not known if this is a cause or effect. Helicobacter pylori bacteria: These bacteria exist normally in your digestive tract. Some NYC dermatologists have postulated that it increases the level of a protein called bradykinin, which causes your blood vessels to expand or widen. Genetic predisposition: Manhattan dermatology clinics report that rosacea tends to occur within families, although no particular gene has ever been isolated and attributed to causing rosacea. 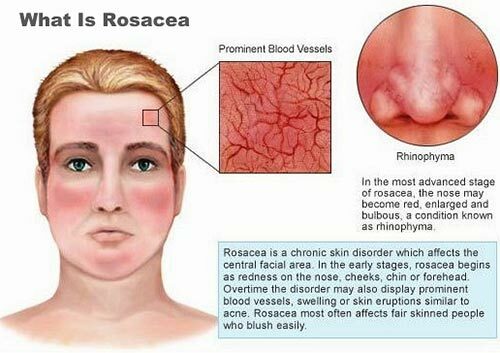 Rosacea is very common, affecting about one in ten people. While there is no cure, the symptoms are treatable. By understanding and avoiding your personal triggers to the flare-ups, you can become an active participant in your treatment. Since the cause of rosacea has never been determined, a cure has never been developed. Nevertheless, treatments for your symptoms are available. The duration and type of treatment depends on the nature and gravity of your symptoms. The disease is resilient, so stay determined and visit a NYC dermatology clinic to fight the reappearance of symptoms. 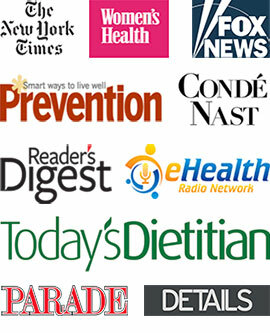 Most best rated NYC dermatologists will prescribe a medication specific to your symptoms. For ocular rosacea, a visit to an ophthalmologist may be necessary. In cases of severe rhinophyma, various laser and surgical options are available. Do you have any questions about Rosacea? Would you like to schedule an appointment with an internationally recognized, best rated dermatologist in NYC, Dr. Susan Bard of Manhattan Dermatology Specialists? 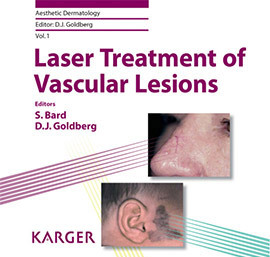 Please contact our Midtown or Upper East Side NYC office for a consultation with cosmetic and laser dermatologist.